LOCATION: On Hwy 31E at Canmer, turn East onto Hwy 677 and proceed 2 miles – then turn right onto Hwy 1573 ( Hedgepeth Road), traveling approximately 2 miles. Stop at the stone house on the right (W. E. and Jean Hedgepeth) across from Hedgepeth Farm Supply and inquire as to the best way to get to the cemetery which is in a field behind their house. 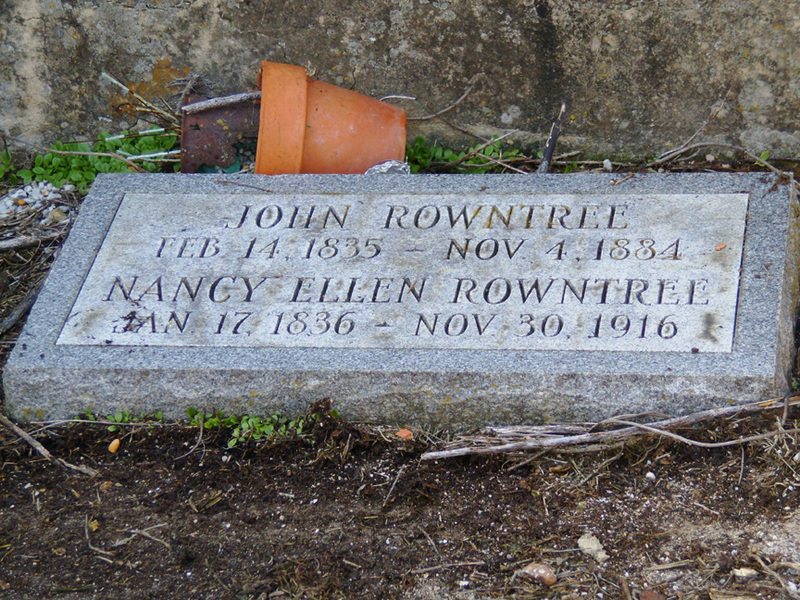 COMMENTS: It is not known exactly why the Cemetery is known as the Adam Rowntree Cemetery since the only two known burials are John and Nancy Ellen (Cannon) Rowntree. John had a half-brother named Adam who was considerably older than he and who remained a part of the household of John’s Mother, Lucy (Watkins) Rowntree, widow of Henry Rowntree, for many years. H/O Nancy Ellen (Cannon) Rowntree (they were the parents of ten children); S/O Henry & third wife, Lucy (Watkins) Rowntree. NOTE: Henry married (1 st) Sallie Bradsby; (2 nd) Wealthy Richardson & (3 rd) on 4 Mar 1829 to Lucy Watkins. Henry had no children from first marriage, one from second (Adam) and six from his third: Sarah, Elizabeth, John, Polly, George and Joana. After Henry’s death in 1845, his son by Wealthy remained in the household of Lucy and her six children. Henry and Lucy are buried in the Rowntree – Sherfey Cemetery on Hoot Owl Hollow Road near Canmer. It is also known as the Old Henry Rowntree Cemetery. KY Historical Society Records state that Adam, Elizabeth and George are also buried at Rowntree – Sherfey w/o markers. NOTE: As written by Gradie Raymond Rowntree, M. D., and published in the Hart County Historical Society Quarterly, Vol IV, No. 4, October, 1972, John Rowntree (1835 – 1884) born in Hart County, KY, was a brick maker, farmer and tobacco grower. He burned brick in brick kilns, keeping wood fires going in the kilns day and night. His formula was sand, clay and water placed in a hopper and hitched to two horses to mix the material before it was placed in the kiln, the brick selling for $3.00 per hundred. John’s parents were, Henry Rowntree, born in Bedford County, Virginia on 5 Feb 1780 and third wife Lucy (Watkins) Rowntree. Henry and Lucy are buried in the Rowntree – Sherfey Cemetery in Hart County. Henry served in the War of 1812 and was in the Battle of New Orleans. He was the son of Mary “Polly” (Hughes) Rowntree and Samuel Rowntree (b. 1756 in Bedford Co., VA – d. 28 Sep 1805 in Christian Co., KY), a Rev. War soldier serving at Fort Ticonderoga as a member of the elite Colonel Daniel Morgan’s Rifle Regiment. Samuel was a son of Dudley Rowntree, Sr., of Bedford County, Virginia, and Susanna (Roberts) Rowntree. Dudley Sr. and his family came into Kentucky, which was still a part of Virginia, sometime in the late 1780’s. Records show that four of his children were married in Bedford County, Virginia from 1779 – 1783. Kentucky records show marriages of his younger children occurring in the 1790’s. They came over the Cumberland Gap and located in the Barrens where the settlers were subjected to attacks by Indians yet in the area. He came in the hope of becoming a great landowner like his father in Virginia, ultimately acquiring more than 5,000 acres on Green River north and east of Canmer. In 1799, he was nominated by Virginia Governor James Gerrard as Justice of the Peace for Barren County. He was reported to be of a pleasing manner, kind and generous, of the Episcopalian faith and later Presbyterian.